When making over a bathroom for your tween or teenage daughter, it’s all about the lightening. The first thing we did was select a new vanity light. When shopping for a new vanity light look for one where the lights shine down toward the mirror instead of up toward the ceiling. This provides better lighting for makeup and there will be fewer shadows. After removing the original vanity light, I discovered two golf-ball sized holes in the drywall. These were concealed behind the baseplate of the original light. The new light has a much smaller baseplate, so the drywall had to be patched and the paint touched up. 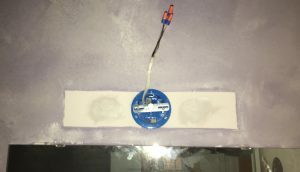 I have patched the drywall as you can see. 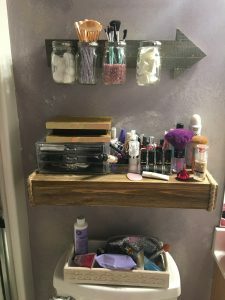 Teens aren’t typically the most tidy of individuals and having makeup storage that is convenient to use is a necessity. The containers should be clear so they can see the products, and also should be very easy to get items back in their correct place. We looked over what items are currently being used and determined we need storage for makeup brushes, cotton balls. To store these items, while staying on trend, we found this rustic arrow and we attached mason jars to the arrow. Step-by-step instructions can be found here. This cute tray sits on the tank to hold whatever misc items she needs (or whatever I find sitting out on the countertop). 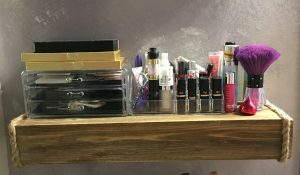 This clear makeup organizer sits on her shelf and contains lipsticks, mascara, etc. Next you need a place to store heated items. like her flat iron, curling iron, and hair dryer. This storage should be placed near the outlet, and easy to reach to reduce the chance of a burn from an accidental touch. I found this cute little bucket which fits perfectly with the farmhouse feel she wants for her bathroom. 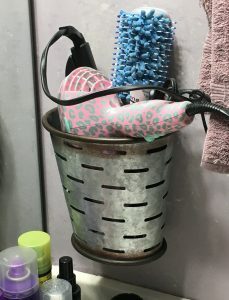 She was able to fit her hair dryer, flat iron, and hair brush in the bucket. 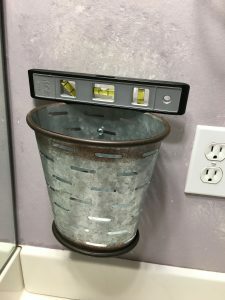 It was a little tricky to hang this bucket on the wall because it had to be hung with two screws so it wouldn’t twist, and tightening the bottom screw was a bit of a challenge – even with a stubby screwdriver. Since I didn’t have an off-set screwdriver, I installed the bottom screw first. 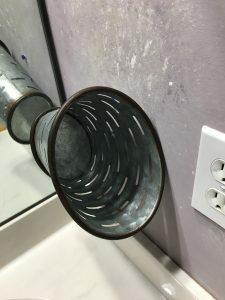 I was able to turn the bucket while installing the bottom screw, but I didn’t tighten it all the way down with the bucket turned because straightening the bucket with the screw tight would have left marks on the wall. Be sure to keep your daughter’s style in mind when remodeling the bathroom. Let her pick the paint color and accessories. While you might not be able to let her choose everything (unless you want a $600 light fixture) you can select a few that will work and work with her on making a final choice. Teenagers will be much more willing to keep everything looking as good as new if they have pride in the outcome. The best way to do that is by being very mindful of her style. My daughter loves the farmhouse style and I tried to incorporate that whenever I could. We all love how this project turned out. 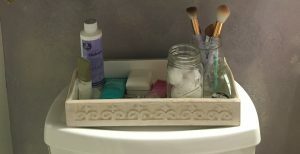 My teenage daughter was happy to have her bathroom finished and her younger brother was happy to have the makeup out of his bathroom!